Weaning is a crucial time in the management of ewes and lambs. It is when lambs are no longer allowed to nurse their dams or they are no longer fed a milk replacer diet. With the exception of artificially-reared lambs, weaning also includes separation from the dam. 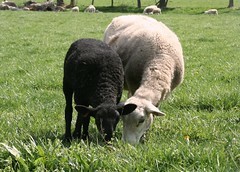 From the milk diet, lambs may consume forage, grain-based, or mixed diets. Weaning can be stressful for both ewes and lambs. Minimizing the stress at weaning and easing the transition are important goals. There is no "best" age to wean. Weaning age varies greatly in the US sheep industry (it averages 4 months) and depends upon many factors including facilities, availability of pasture and other feed supplies, and target market(s). Lambs have been weaned successfully as early as 14 days (rare), while some lambs are allowed to wean naturally, staying with their dams for six months or more. Some lambs are sent to market at the same time they are weaned. Early in life, the lamb cannot digest anything but milk. Soon after birth, it begins nibbling on food. By 3 weeks of age, its developing rumen makes the lamb more efficient at converting feed than the ewe. Typically, the ewe's milk production peaks 3 to 4 weeks after lambing and steadily declines to about half as much by 10 weeks. About 74 percent of all milk is produced in the first 8 weeks of lactation. Dairy ewes have a flatter lactation curve; they produce more milk for a longer period of time. Early weaning usually means weaning at any time after 21 days of age, but usually before 90 days. Sixty (range 45-70) days is a common weaning age in intensively managed sheep operations. 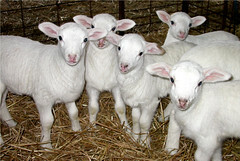 It is common to wean lambs in a dairy sheep operation when they are 30 to 35 days of age. Early weaning can be successful, provided lambs are drinking water and consuming adequate amounts of dry feed, at least 0.5 pounds per day, preferably 1 pound. 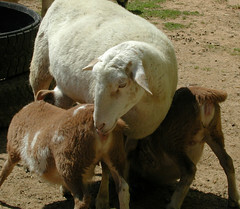 Creep feeding is a part of most early weaning programs. 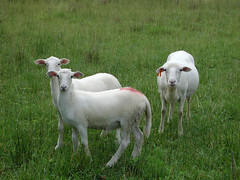 It is generally not recommended that pasture-reared lambs be weaned before they are 90 days old, unless the pasture is very high quality (alfalfa or clover). The size of the lamb at weaning is generally more important than its actual age. As a rule of thumb, most lambs can be weaned at 60 days of age or 45 pounds, whichever comes first (though this will vary by breed). Another rule of thumb is three times the birth weight. Early weaning offers many advantages. Weaned lambs are very efficient converters of feed to lean tissue. It is usually more efficient to feed grain to lambs than ewes because lambs will convert feed to gain more efficiently than the ewes can convert the feed to milk to lamb gain. 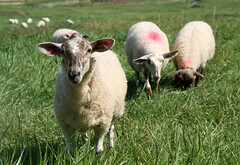 Early weaning eases the lactation stress of high-producing ewes, especially young ewes. It allows ewes to return to breeding condition earlier, which is essential for accelerated lambing programs. Weaning lambs early and placing them in dry lot for finishing saves pasture and enables the producer to maintain more ewes on a given amount of land. In drought years, early weaning is a common strategy. With early weaning, cull ewes can be sold earlier, sometimes for higher prices. Lambs are usually marketed earlier in the year, when prices may be higher. However, early weaning is more stressful to both the ewe and lambs. Ewes are more prone to mastitis because they are still producing milk when their lambs are removed. Lambs have a reduction in their food supply. Orphan lambs are a special case. Early weaning should always be the goal. Artificially-reared lambs can be successfully weaned from a milk diet at 25 to 30 pounds body weight or when they are 30 to 42 days old. Weaning abruptly is better than offering a diluted milk replacer the last week. However, orphan lambs should not be weaned unless they are drinking water and consuming adequate amounts of dry feed. Orphan lambs that have been weaned and merged with rest of the flock should be closely observed for signs of disease and ill-thrift. Without intervention, weaning occurs naturally at approximately 6 months of age, usually in the fall when the ewes begin returning to estrus. Spring-born lambs are usually weaned later than winter-born and fall-born lambs. In fact, it is not uncommon to leave spring-born lambs with their dams on pasture until they are ready for market. Four months is a typical late weaning age. There are several advantages to late weaning. 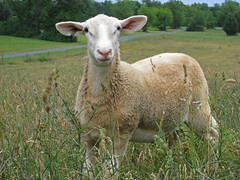 It is more natural and results in less stress for the ewe and lambs. There is less risk of the ewe developing mastitis since her milk production has declined significantly by the time the lambs are removed. Late weaning allows the producer to take advantage of available forage for lambs. It enables the producer to keep ewes and lambs in the same management group. Pasture gains can be more economical than those achieved in a grain-feeding situation. On the other hand, lambs must compete with ewes for the available forage, especially high quality forage. They are also more likely to become infected with worm larvae and develop clinical signs of parasitism, sometimes even die. Predator problems are greater when lambs are pastured. If male lambs will be left with their dams past 3 to 4 months of age, they should be castrated. Castrated rams do not grow as fast as intact males. It is not necessary to castrate ram lambs. 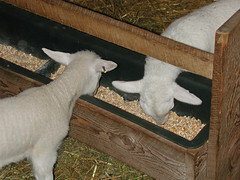 It is more efficient to feed grain to lambs than ewes. It allows ewes to return to breeding condition earlier. Cull ewes can be sold earlier. Lambs can usually be marketed earlier. Pasture is saved for ewes. More ewes can be maintained on farm. Lambs and ewes are less stressed. There is less risk of mastitis. It requires less pens and/or pasture fields. It takes advantage of available forage. Pasture gains may be more economical than feedlot gains. It is more stressful to lambs and ewes. Ewes are more prone to mastitis. Extra pens and/or pasture fields are needed. Lambs have to compete for the same pasture as ewes. Lambs are more likely to become infected with worm larvae. Lambs are exposed to more disease agents. Predator losses could be higher. Ram lambs need to be castrated. The main concern at weaning for ewes is to prevent mastitis problems. Ewes with mastitis have reduced or no production value in future years. The easiest way to prevent mastitis is to halt milk production. Approximately two weeks before weaning, grain should be removed from the ewes' diet. If possible, you should feed a low quality forage prior to weaning. Feeding straw the last 2 to 3 days before weaning further shuts down lactation. After weaning, ewes should be maintained on low quality feed for 3 to 7 days to assist ewes in drying up. Some producers withhold or restrict water intake before and after weaning. However, removing water from the ewes' diet during hot weather can be dangerous and is not recommended. Ewes should not be turned out to lush pasture immediately after weaning. Spring forage is high in protein, water, and other nutrients which promote milk production. Ewes should closely monitored for signs of mastitis. Ewes with mastitis should be given veterinary care. Ewes with spoiled udders should be culled. Generally, weaning is more stressful for lambs than ewes. At weaning, the lambs are challenged not only by being separated from their mothers, but also by their need to fend for themselves nutritionally. Their immune systems are not fully developed, and they are more susceptible to disease, especially internal parasites (worms + coccidia). When weaning, the ewes should be removed from the lambs, not vice versa. By leaving lambs in the same location, they will experience less stress and are less likely to go off feed because they will know where the feeders, minerals, and water are. It has generally recommended that ewes and lambs be kept far enough apart that they can't hear each other. It's important to maintain the same groupings during weaning, e.g. keep siblings together. Newly weaned lambs should have plenty of clean, fresh water at all times. Lambs should be kept on the same feed before and after weaning until the stress of weaning has past (7-10 days). Feeds containing urea should not be fed for at least 2 weeks past weaning. Lambs weaned at 10 weeks of age will recognize and return to their dams after 2 months of separation. After weaning, twins will stay together for the first few days. Newly-weaned lambs should be closely monitored for health problems. Coccidiosis is most common in weanling lambs. Weaned lambs are also highly susceptible to worm parasites, as they lack immunity. 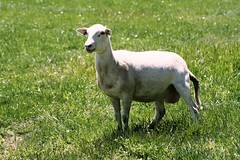 Enterotoxemia (overeating disease type D) is more common in early weaned lambs. It can be prevented with vaccination. 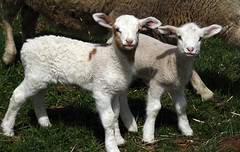 Lambs from vaccinated dams should receive their first vaccination for type D at approximately 6-8 weeks of age, followed by a booster 2 to 4 weeks later. All vaccinations should be given prior to weaning. Creep feeding reduces the stress of weaning, especially early weaning. With cattle, the stress of weaning has been reduced by allowing the cow and calf to have fenceline contact. However, this practice does not seem to have the same beneficial effect on lambs. On the other hand, a two-stage weaning process has been shown to reduce the weaning stress. In the two-stage weaning process, lambs are prevented from suckling for one week prior to separation from their dams. Traditional weaning usually involves abrupt separation of ewes and lambs. An Australian company (www.easywean.com.au) markets a "nose ring" or anti-sucking device that prevents lambs from nursing (the ewe rejects attempts to suckle), which dries up the ewe's lactation while maintaining the maternal bond and allowing ewes and lambs to be managed as a single mob. The ring is a plastic device that clips into the partition between the lamb's nostrils. It should stay on for 2 weeks to allow the ewe's lactation to dry up. The rings are reusable and 90 percent effective. They reduce weaning stress and enhance animal performance. They do not prevent the lamb from grazing. Lambs should be weighed around the time of weaning in order to calculate adjusted weaning weights (usually 60 or 120-day). Lambs with the highest adjusted weaning weights should be retained for breeding. 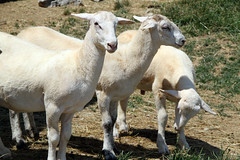 Ewes that wean the heaviest litters will make the most money and should be favored in breeding and selection decisions. Weaning weights are indicative of a ewe's performing ability, whereas post-weaning weights are more indicative of the sire's influence on growth. Late updated 28-May-2017 by Susan Schoenian. Copyright© 2016. Sheep 101 and 201.